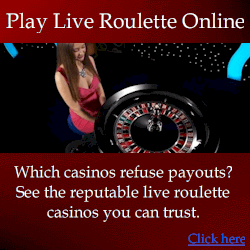 In the gambling industry, professional roulette system players are known as “undesirables” or “advantage players”. These are the players that know the secrets of winning roulette. Gambling professionals and casino owners alike know such roulette secrets, although the general population still consider roulette to be the notorious game that’s impossible to beat. The average “gambler” will just continue to develop gambling methods to win, oblivious to the fact that many have tried their approach before. There are only a small handful of ways that enable consistent winnings. So what are they? . . .
First, as you can imagine, casinos have an enormous amount of people coming through their doors and most has their own “secret” system or roulette strategy of play. Additionally, just about every player loses. They may walk away with the occasional win, but on the whole experience a gradual decline of their bankroll. This is not what should occur if the player’s strategy or roulette secret were effective – it should be quite the opposite. # 1: Wheel manufacturers specify that the ball must complete at least 4 revolutions before the ball falls, and the wheel rotor must be above a particular speed. This tells us the fewer ball revolutions there are, and the slower the wheel rotor, the more predictable spins are. Do these specifications mean anything adhering to them will produce unpredictable spins? Certainly not. It is only a guideline from the manufacturer. # 2: Casinos usually allow bets after the ball has been released, but call no more bets as soon as all chips are wagered. Bets that are to late are not accepted. This tells us that where the ball will fall can be predicted if the wheel and ball speed is measured. # 3: If you stand around scouting for wheels and writing down the spin results, you draw suspicion. Of course you may be the average gambler that looks for patterns in red and black numbers, or try and connect the dots to find patterns that don’t exist. But that’s not what the casinos are worried about. They are concerned you may be doing a correct analysis to exploit mechanical flaws and other conditions that make spins more predictable. The casino has their own secret roulette software to check for flaws, and you can see it usually where the pit boss stands. It checks for a number of things, but primarily checking that no bias is present. A bias is where the ball tends to favor one number or wheel sector more than another. An example of this software is at www.tcsjohnhuxley.com.au – this is also the manufacturer of the most common roulette wheels. 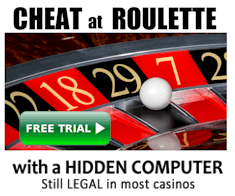 In truth the software is inadequate for many reasons that I will not disclose – some secrets are just too sensitive, and it is quite easy to exploit a bias even before the casino knows about it. Furthermore, by knowing many personally, casino staff largely ignore the data unless someone has actually exploited a bias and left with winnings. This means there are plenty of opportunities for bias analyzers to perform a deeper analysis that the casino’s software simply doesn’t do. # 4: Many online casinos forbid any kind of wheel or spin analysis. Why? Because when you can’t bet after the ball is actually released, it’s the only possible way to win. This is a big clue. I personally know of many players who have been refused payouts after winning large amounts at online casinos. The most common excuse is that the player analyzed the spins. However, I have never seen a real casino (not online) refuse a payout or forbid wheel analysis. But they don’t like players analyzing spins because they know a correct analysis can most definitely be used to formulate a genuine winning system. # 5: Dealers are rotated frequently. This is because if a dealer stays at one table too long, then it is very easy for professional players to determine if the dealer has a “dealer signature”. This is when the dealer spins the wheel and ball much the same speed, and it greatly increases the predictability of spin outcomes.